As an inveterate chow hound I like to know if the restaurant I’m about to visit has a) a working bathroom b) PBR c) any health violations. While the first two are deal-breakers – it’s not a dinner without the smooth taste of the Ribb – I’m often very lax when it comes to health violations. Not many others are. 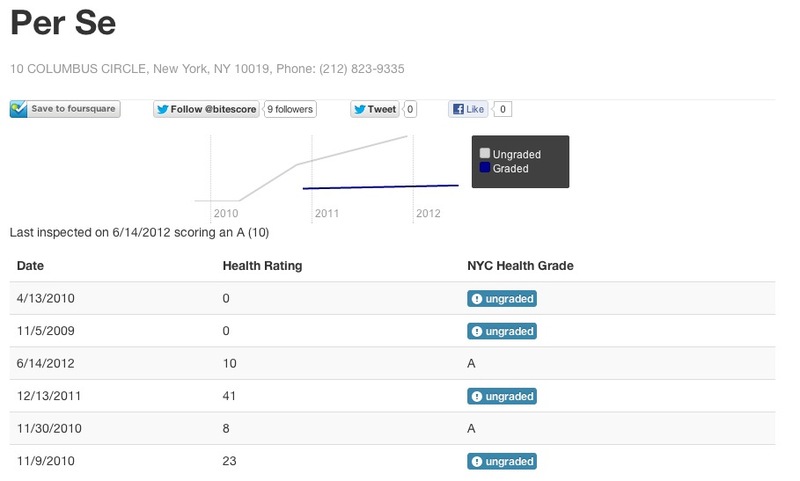 BiteScore is a tiny app that tells you the health rating of a restaurant you visit on the web. After installing it, you can visit Zagat or another review site and see the score right there. Want to know if your favorite Greek place has mice? Bang. Right there. Want to know if that sushi place sometimes serves “imitation” eel? Boom. BiteScore. BiteScore also builds a fairly staid results page that exposes the change in health violations over time. For example, Per Se scores an “A” rating while other, lesser restaurants limp along with a “B”. Founded by Lior Gavra and Ryan Hoffman (who are clearly more concerned with cat dander in their soup than I am), the site is self-funded and seeing about 100 users a day. Because it is a Chrome add-on there’s not much branding, but if you use sites like Seamless and OpenTable, knowing whether an Ethiopian place serves actual fingernails with its finger food is a godsend. It adds a small bug to these pages that adds just a bit more information to already information-rich pages. The pair isn’t looking for a big exit or lots of revenue. Essentially, they’ve added a key element to restaurant listings and they’re offering it for free – a noble effort, to be sure. After all, as anyone who has discovered that the green lump in their butter sauce was not, in fact, a caper, forewarned is often forearmed.